Some people have kindly been asking me about my ‘Murder’ series, but I’m afraid that you’re getting ahead of yourselves, we haven’t even made that one yet! Next up will be ‘Fit to Rule?’, which is rumoured (and I stress rumoured) to start on 26th April. Here’s the official explanation of what it’s all about. It’s a bit more serious and grown-up than some of my previous efforts, and I’ve enjoyed the change of tone. It’s also been a wonderful showcase for the buildings and collections we look after at Historic Royal Palaces. ‘Orthopaedic’ boots (look at the metal round the ankles) said to have been worn by the young Charles I. He had wobbly legs from rickets. 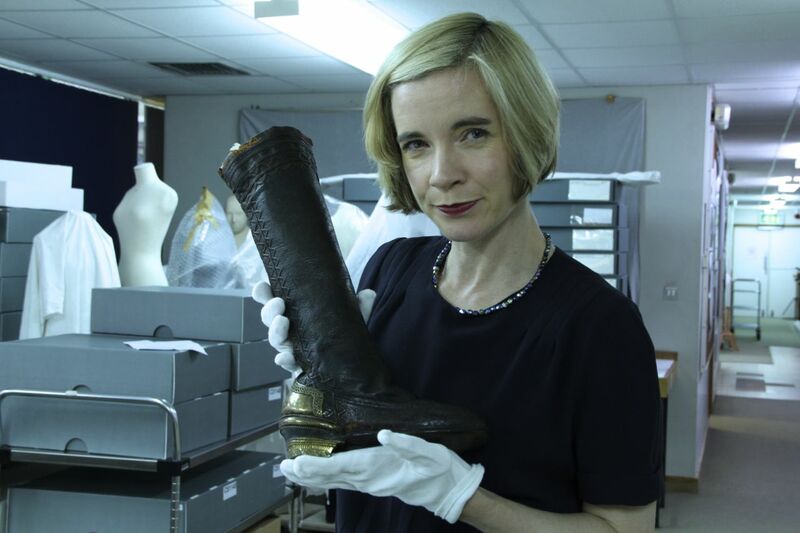 ‘In this three-part series for BBC2, Lucy Worsley, Chief Curator at Historic Royal Palaces, gives a new explanation for the enduring power of the British monarchy. From Henry VIII to the abdication of Edward VIII in 1936, successive monarchs gradually lost political power. And yet the British monarchy still survives: unlike its equivalents, which have collapsed all over Europe. This series re-introduces our kings and queens, not just as powerful potentates, but as human beings, each with their own very personal problems of biology and psychology. These intimate, individual problems have affected the course of the history of the nation. 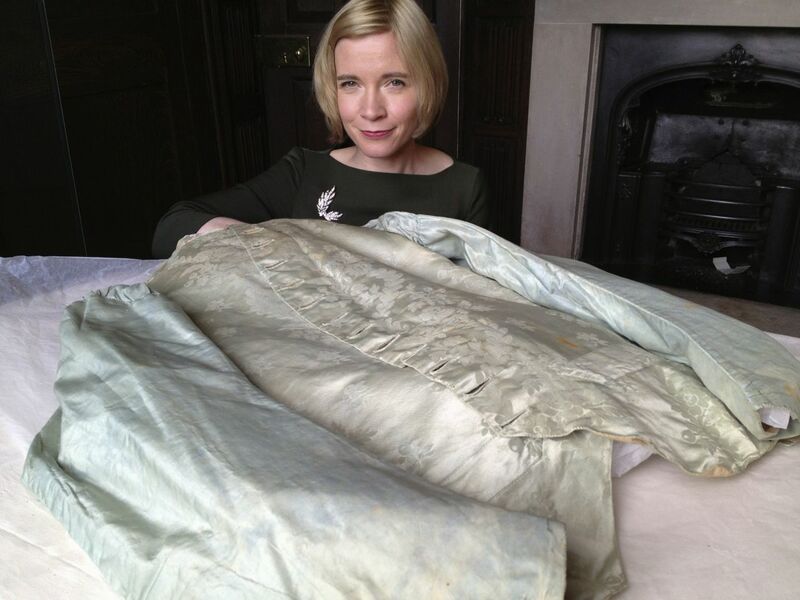 Over the course of the series Lucy will examine royal clothes, medical records, personal letters and diaries to gain a unique insight into the intimate mental and physical worlds of the real men and women who lie behind the regal portraits. Assessing them against the regal job description, Lucy argues that kings and queens have had to deal with infertility, religious extremism, depression, bisexuality and culture shock through being born abroad. She reaches the surprising conclusion that monarchy isn’t about the survival of the fittest. Against all the odds, a weak or inadequate king or queen can help the monarchy, by forcing it to adapt – and survive. Henry VIII had all the attributes of a great king: charisma, intelligence, and physical strength. But he was dogged by desperate biological difficulties in fathering a male heir. His efforts to reproduce led him to split the Christian church, and created a toxic religious legacy between the three children he had with different mothers. And yet, Henry’s heirs did an unexpectedly good job. His successors were a boy (Edward VI), a woman married to a hated foreigner (Mary I), a childless woman (Elizabeth I) and a man who was openly bisexual (James I). The only real failure among them was Charles I, who squandered a stable legacy to throw away his throne out of a stubborn belief in his divine right to rule. Their subjects made it very clear whether they considered the Tudors and Stuarts fit to rule or not. They believed that Henry VIII had many of the powers of a god. A century later, they proved Charles I to be only a man – by cutting off his head. Waistcoat of George III’s, with enlarged shoulders so that he could be dressed by his pages during his episodes of illness. He had to be fed by them, too, and the waistcoat bears stains of food or dribble. But the institution of monarchy could survive a bad king. The late seventeenth century saw a new type of ruler – monarchy by the consent of the people. In 1688, William and Mary took the throne on the basis of a written contract, the Bill of Rights. But these late Stuart, and then Hanoverian, monarchs paid a high personal price for their circumscribed power. They had more than their fair share of unhappy marriages and bitter rivalries, particularly between fathers and sons. They were players in a psychodrama that produced generations of damaged human beings. This bad blood was the burden carried by individuals thrust into the role of constitutional king, and it led to depression, madness, drug addiction and woe. Here I’m with one of the young Queen Victoria’s dolls – companions of her lonely childhood. The bitter legacy of the Hanoverians seemed to be erased by the young, vivacious and popular Princess Charlotte, heir to the throne – until, in 1817, she and her son died in a traumatic childbirth. Charlotte had been a new kind of princess, seeking personal fulfillment and ‘real domestic happiness’ in her marriage. In due course, Queen Victoria too would place enormous importance on a happy family life – believing that she could now not rule, but only reign, and that she had to set a good example at home to her increasingly middle-class subjects. She and her descendants re-invented the job of monarch, using pomp and ceremony and appearances to influence rather than command. But Victoria’s children could never live up to her high moral standards. Her son, Edward VII, with his many mistresses, was the opposite of a happy family man, and her great-grandson Edward VIII felt forced, in 1936, to give up the throne for the sake of the woman he loved. Really loved the three part series which has just finished airing in Australia. If poss can you please advise where I can purchase the three DVD’s from the Fit to Rule series ? I’m afraid there aren’t any DVDs available. But you can watch the whole show (illegally!) on YouTube! Hello lovely Lucy–please solve a perpetual mystery for me. Why-Why-Why, are the no DVDs of all your excellent and unique TV series? I’ve spent god knows how much time on the web, searching for them, only to find that only books are available. Nice though that is–I just LOVE your presentations on TV–for me, it’s what makes history such a pleasure to learn, and re-discover. Affectionately–Philip, Bristol. I don’t think Edward VIIIth was unfit to rule, he could have been crowned and then married Wallis Simpson. This was suggested to him by the politicians and the clerics. Edward said that he could not be crowned and anointed with a lie on his mind. I think his behaviour admirable rather than the determination of the Duchess of York who would be Queen at any cost. going back over generations of both sides of my family male and female, being mainly working class, i believe all were born in the area of what was roman britain that would make me BRITISH and not english (anglo-saxon,german) I am rubber stamped by subject to the rule of the hanover family,am i right? Good fortune being that the english princes have married commoners,perhaps the common blood will improve the i.q of future english rule?